Welcome back if you are returning to read this sequel to New Frontiers in Education (Part 1- The Why’s of Homeschooling). If you are a new reader to Modern Pioneer Family and interested in the topic of Homeschooling (or interested in supplementing the education your child is recieving from a public or private school), then we encourage you to read our previous post on this subject. I asked my dear friend, Aimee Packard, a homeschooling mother of two wonderful boys, to write a guest post for us on my blog about Homeschooling (as a New Frontierr in Education.) It just happens that Aimee is very passionate about this topic and not only did a fabulous job writing about it, she went above and beyond and wrote 2 guest posts for us to read and consider here on Modern Pioneer Family. One of the reasons I wanted to cover this topic is that in the Colonial and Pioneering periods in North American (both in the United States and Canada, our northern neighbor), education of the family within the home was a mainstay of our culture. Even when those homes were represented by a covered wagon for families moving westward, children were being educated. There still exists in North America today where public schools are so few and far between that parents consider homeschooling a better option than busing their children 40 miles or more one way to the nearest school (that would be the length of the trip if the family drove it, add in the school bus route and you could easily end up with a 2 hour trip one way or more for students to just to get to school and another 2 hours + to return home.) If school began at 8:20 am and got out at 3:30 (an average school day most places), this could easily put a kindergartener getting on the bus at 6 am (probably waking up at 5 am) and not returning home until after 5:30, if they happened to be the kids furthest from the school. This is a situation my own family has faced at our current public school and when the school district was considering consolidation with the next nearest school which would have added at least another 45 minutes each way, well that would not have been an option we’d have chosen as a family had it materialized. By the time our boys get home, do their few little farm chores (feeding the dogs, rabbits and chickens and gathering eggs) and eat supper they are too tired or too irritable to really apply themselves to doing any assigned homework. Thus both their grades and their learning is compromised. If, I want to keep them caught up to their grade level, I must supplement their education on weekends, school holidays and in the summer. And now that I have gone into some depth about why I asked Aimee to cover the topic of Homeschool (because I felt my own children would benefit from my learning more about it mostly), here is her post for you to consider and ponder in your hearts. There are many basic steps to “seriously thinking about homeschooling”. I will list them out, and talk about them, give you a few options and starting places. Again, remember entire books are written about this topic, and actually about some of the subtopics; this is a brief concise starting point, how-to get started in seriously considering the option to homeschool or the option to supplement a lackluster education being provided in public schools at home with additional help for struggling students or to cover subject matter NOT covered in local schools. However I am not going to be put them in a strict order. I’ll order them for the sake of writing clarity; but the order you choose to approach the steps in doesn’t need to conform to my sequence. Everyone thinks, takes in data, and processes information differently, that is what makes homeschooling work. Adults are no different than children – and we all have our own “needs” when approaching a new, or not so new, topic. Let me say from the start I LOVE my library and I love my librarian and I LOVE that she does Inter-Library-Loan (I.L.L.) for me. (I love her for many reasons, but her active I.L.L. is on the top of the list). It is a strict rule of mine I do not buy any homeschooling book – either for my own edification, or to use directly with the kids – with out physically viewing it first. I have requested so many books I.L.L. (because we have a small local library) and been so glad I did when I did not like them; or after reading the book once did not feel it was worth buying to own. Get to know your librarian!!! He or she will be an amazing resource for you now, and especially as you start to educate at home. Request books you library doesn’t have; check them out, read books before you buy (or decide not to). There are so many good books out there; search on amazon.com and then go to the library. You’ll find some you need to own; you find some you don’t read more than a chapter of and some you will be glad you read once, but can always request again later if you want to reread it. 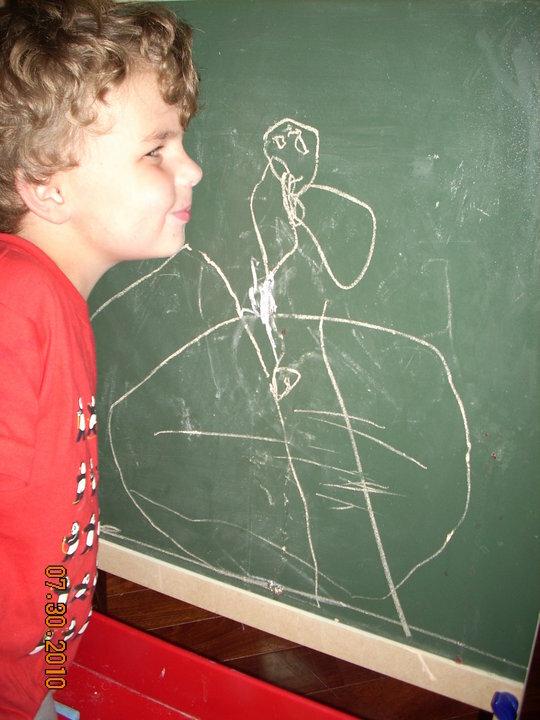 There are many “schools of thought” on home education; Montessori (http://www.montessori.edu/) , Waldorf (http://www.whywaldorfworks.org/), classical, Charlotte Mason (http://simplycharlottemason.com/ — one of my all-time favorite homeschool websites, by the way), un-schooling. 1. One free resource is http://www.currclick.com/product/22668/Homeschooling–The-Other-Side-of-Education?it=1 Homeschooling- The Other Side of Education. It is a much more complete look at what I have been discussing in these two posts. It is free and a fast easy read. This e-book is worth the time to cover the basics. 2. http://classicalacademicpress.com/images/free_resources/20091210_ICE.pdf is another FREE e-books (about 45 pages if I remember correctly) that give a solid introduction to Classical Education. It is an excellent resource. Even if you do not feel drawn to Classical Ed it is a good (FREE) read to start you thinking and asking question about education. 3. State laws for the State you live in. Every state has laws that govern home schooling, school attendance and school recording. LEARN YOUR LAWS. If you are in a highly regulated state and thus will be expected to do a great deal of reporting and recording, that could realistically affect you schooling choice. http://www.hslda.org/laws/ is certainly a starting point; just be sure you are aware of what is legally required of you in your home state. Knowing the laws to which you are required to adhere will help you in making your homeschooling decisions and it also will help you defend your rights to homeschool, if there is ever a problem with your school district, local or state government. If you know your rights as a homeschooling family, then you will know if educational officials ever try to encroach on those rights. Network. Find support. Most states have yahoo groups. My locations have live support groups (Park Day and other events are very common). Make connections, homeschooling can be very lonely; and experienced home education families can be a Godsend to get you up and running and though that first year (or that first year of high school). Join a message board to two; great conservation and tons of experienced parents happy to help you. Surf the web!!! There are some great sites (and some real losers too). Look around, browse. A good site, not so much how to, or why to: but to show you what tools are out there to help you, to guide you, and to assist you in educating your children, either full time or after school if you decide the education they are currently receiving is not up to muster (and trust me, test scores be damned, it is not) go to your local library and check out (or request on inter-library-loan) 100 Top Picks for Home school Curriculum: Choosing the Right Curriculum and Approach for Your Child’s Learning Style by Cathy Duffy. The last actual publication was 2005 (I hope there will be a new one soon) but there is up-to-date data on her website. http://cathyduffyreviews.com/. http://www.homeschooldiner.com/ is a fun site, and not overwhelming. Finally, most important, is READ, read, read, read…..here are a few suggestions to get you started. Look them up on amazon.com and look at all the linked books, explore – be a kid again, nothing you look at or read can hurt you. If you do not like it leave it and go on. There are many many good books out there, and many great websites. All you have to do, all you can do, is start reading and educate yourself about your child’s education. Honey for a Child’s Heart. http://www.amazon.com/Honey-Childs-Heart-Gladys-Hunt/dp/0310242460/ref=sr_1_1?s=books&ie=UTF8&qid=1333066983&sr=1-1 By Hunt the power of reading with your children, no matter where they do their school work. The greatest power a parent has is the power of reading. Remember if you choose to educate your child fully at home, or to supplement, you are not facing teaching everything a child needs to learn and you have forgotten off the top of your head. There are books and full curriculums to walk you though it; you are not alone. There are many resources out there that are available for free or of little cost, so do not be daunted in your desire to educate at home by advertisements for expensive full-curriculums that all insist they are THE BEST, you can pick and choose from affordable and/or free lesson plans and materials to piece together a curriculum that will suit your child’s needs. Well, this is our 20th blog post at Modern Pioneer Family! We’ve been blogging almost a month now, so we’d love to know just what you, the readers are thinking! We want to improve your reading experience. Please take a few seconds to vote in our poll, so that we can bring you more of the posts that you will love most! We are thinking of posting blog posts on our various topic catagories on different days. Make them “regular features” here to keep us sort-of-organized. We already have our Mystery Recipe Monday features. Are you all liking that one? We are definitely going to start doing a middle of the month-ish, after the 4-H meeting recap and update on the Farmer Boys’ 4-H projects. What else would you like to read about regularly? Service Dog Saturdays with the K-9 Pioneers? Lots more recipes for Gluten Free cooking? How-to’s on fixing or building things with Pa and the Farmer Boys? Crafting and household how-to’s with Ma? the Littlest Pioneer Girl’s lessons in grammar and vocabulary? After a month, it’s time to find out what is going to bring you the readers, back for more? We always welcome your insights, questions and comments to our posts, and are especially looking forward to them when do a post like this one. Besides, it’s an important election year, so we think it’s a good thing to practice voting… that way maybe we will all remember to vote in the Big Election this coming November. In the interest of a busy day and recipe days being our most popular days… we will literally keep this short and sweet. 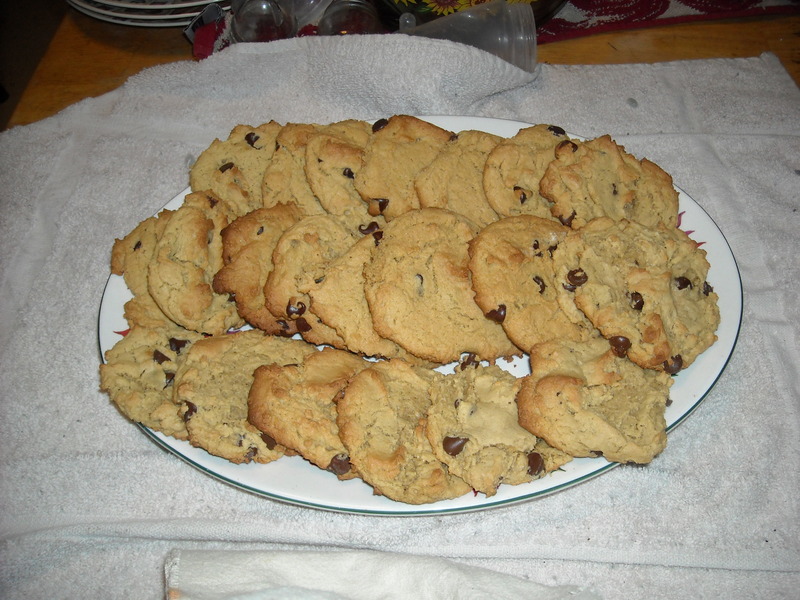 I stuck very close to the original recipe with these cookies. Equipment: large mixing bowl and electric mixer (or a heavy duty stand mixer like KitchenAid which is what I use and I usually double the batch size), wooden spoon, parchment paper, cookie sheets, cooling rack, a metal pancake flipper and a cookie scoop. Cream ” butter” and sugar until light and fluffy with an electric mixer. Add eggs one at a time and mix well between additions. Add vanilla extract and mix again. Sift together dry ingredients, add slowly to butter mix mixing well between additions. Add in chocolate chips and mix again and then add nuts and mix those in too if you are using them. Preheat oven to 350 F. Place cookie dough on cookie sheets lined with parchment using cookie scoop or by heaping spoonfulls. Bake 8-12 minutes depending on your preferred doneness and your oven until lightly golden (we like them soft and chewy here). Allow to cool slightly (5 min or so) on sheets before removing to a cooling rack or platter. You can also make this dough in advance, form into logs and wrap in parchment or wax paper, place in a zip-top freezer bag for later use. just partially thaw a log of dough as needed and slice off cookies and bake them as usual. Great idea to have on hand for when the youngster forget to tell you it’s their turn for snack day at school or Sunday School until the last minute or for busy days when a sweet snack or dessert is wanted in a hurry. The post below, New Frontiers in Education (part 1) was written by my dear friend, Aimee Packard. Aimee is a homeschooling mother of two sons with special needs, who contracts through her local school for Special Ed. services, but otherwise educates her children in the family home. Aimee also writes a blog about their family’s adventures as they homeschool and raise children of faith. Her blog Scribing Life can be found here a this link http://scribinglife.wordpress.com/. Disclaimer: I am going to discuss why TO home school, why it is important, why someday it may be necessary and not a merely an option. However, none of this, or any of my comments should be taken as an attack on parents that choose to use the public school as a tool to educate their children. This piece will be pro-home education and will discuss what, to us, are negatives in the public school system. Nevertheless every family has to make their own choice, as led by God. I have dear friends who are not Christian; I have dear friends who make use of the public school system. This is food for thought and is certainly not a judgment on anyone. In the New Frontier there are going to be many ‘new skills’ that are skills our Great-Grandmothers and their mothers will shake the heads in dismay that we have to learn and that we do not simply do with our mind occupied with prayer or something else of value. There is a good chance your life, or your daughter’s life, may resemble your Great Grandmother’s mother’s life more than your mothers’. I pray to be wrong, but the fact is we must be ready. You and I are going to have to learn to cook from scratch, to cook things we never thought we’d eat (maybe), to can, to sew, and to knit, among other skills. One thing we simply must do now, and will certainly be forced to in the days to come, even if we do not choose it today, is personally educate our children. On a mere moment’s notice, if necessary. Read, think, keep materials on hand (great for a rainy Saturday afternoon or the summer). Be ready; know what the kids know and what they need to know. I do not care if your child goes to the best school, with a great teacher, at the end of the day you need to be sure your child is learning the skills and acquiring the wisdom they are going to need. You need to be fact checking their education, and being sure they are obtaining real time-tested knowledge and the ability to use it, and not merely propaganda set forth by liberal government entities. You have be in their books, in their assignments, reviewing their class notes. You have to know what your children are being taught and what they are being exposed to, tested material or not. When the rubber meets the road, maybe in ways unexpected, grades are not going to help anyone. The schools and school teachers, no matter how good, have no vested interest in your child or their life beyond the end of the year test score and beyond high school graduation. God gave us the gift of children on loan my dear friends and we have to answer to Him for their care and the path we put their tiny feet on. There are many places where the public schools are excellent and many good private schools are an option. There are many places where that is not the case. Either way, God is going to ask you, not Timmy’s 3rd grade teacher, about Timmy’s lack of long division skills or his lack of understanding of Seward’s Folly (if you need to look that up: http://en.wikipedia.org/wiki/Alaska_Purchase). Think about it; let’s talk about it. Please remember entire books are written about these subjects, so this coverage is going to be brief, at least as brief as I am capable of making it. It is extremely difficult to compare home school students vs. public school students; at least accurately. Even if it could be done, it really doesn’t matter as we all know correlation does not prove causation. So even if you could truly compare the two, as if comparing the ingredients on a cookie package, you could not say beyond a doubt that the benefit of either was caused by the education choice. Education choices come down to parenting, and good parents assure their children a good education no matter what tools they choose to use. Nevertheless there is clearly no empirical evidence that homeschooling produces negative results compared to standard institutional schooling. Homeschooling is an extension of parenting, and if the parenting is good, the homeschooling will be; but good parents are good involved parents to children in public school too. Parents need to take responsibility for their children, children God has given to them, and the State needs to remember it is NOT the parent and the school needs a strong and constant reminder that they are employed by and function at the pleasure of the parents. If this reminder is in the shape of many children being removed, so be it; if it is the shape of the votes packing the School Board with people of faith, that is another option. What you and I must remember are our God given roles, our responsibilities to our families, and to our Nation. Home education can be, though this is not a primary reason for our family, it is something that I think of, an act of preserving the Republic. As a Nation, we were founded by home educated men; we all have a responsibility to the Nation (under God). Home education is preparing the next generation to lead, not to follow. Home educated individuals founded this nation and it may indeed be up to home educated individuals who are called upon to save it. Consider this: from the 1620’s to the late 1800’s in the United States there was no mandatory public education; for a long time no public school option at all. Education was parents, older siblings, at the kitchen table and a strong commitment to the best the child could be. Parents taught their children to walk, to read and to be adults. Literacy rates in the colonies, (1640 to 1700) particularly in New England, were extremely high relative to those in the Old World; and sadly relative to today. Shipton, New England has a 95% literacy rate. By the middle of the 1700’s nine Colleges / Universities had been founded including Harvard, Yale and William and Mary. All stressed Classical studies and a Biblical foundation. Learning to read, learning to acquire and use information, to manipulate language (written and spoken), learning to think… not learning to pass a test. Freshmen at William and Mary had to “be able to read, write, converse, and debate in Greek”. The King’s College inNew Yorkrequired applicants to translate the first ten chapters of the Gospel in to Latin. Nevertheless Thomas Jefferson, John Adams and James Monroe, all educated at home, of course, entered college at age sixteen. (page 118 The Right Choice Home Schooling by Klicka). There are three main elements, as to why we home school; there are other less critical aspects that make home educating ‘even a better deal’ but for us there are three main ‘deal makers”. Our reason to home school, will not be the same as your reason (or your reasons not to home school). First being we as parents do not want others (adults or peers) having a strong molding influence on our children, we want to strengthen our children’s values before they are loosed into the world and asked to make their own choices. Secondly we dislike the public schools and their humanistic, politically correct, worldly view point; that we feel is not merely neutral (which would be acceptable if not desirable), but actually progressive and liberal. Finally, related to both is the growth my understanding and convictions. In many cases I truly believe God wants our children at home; and in every case no matter what tools you use, God hold the parents exclusively accountable for the education of the youth He gives them. I strongly dislike the idea of someone other than myself or my husband or family fundamentally shaping the beliefs my children hold or their point of view about life and the world around them. This is a statement about the inherent susceptibility of young children to things around them, good and bad alike; young children are sponges. QUOTE: Young hearts and minds are especially vulnerable, having an amazing ability to absorb large amounts of teaching innocently, naively, without judgment, prejudice or bias.” The How and why of Home Schooling by Ballmann page 20-21. A big part of our parental choice to home school has to do with faith, but even more so with our understanding that children, any children are not strong enough (emotionally or spiritually) to be a leader and not a follower at 5, or 7. Peer pressure and influence is not only for teenagers. Big Brother came home from a week of Vacation Bible School (15 hours total) with new less-than-desirable phrases added to his vocabulary. Bullies do not live only in middle schools and high schools either; again, Big Brother came home in tears 2 out of 5 days of VBS. At VBS, he was in a group of 8 children with an adult and a couple of older youth helpers; what could be expected from him being a peer group of 20 or more with only one adult? Yes, there will be leaders in Kindergarten – but the question we have had to ask is “if my child is not the leader, where will that leader take my child?” There will be bullies in Kindergarten- what a choice!! For our child to be either the bully or be bullied! Can you honestly expect a 6 year old to walk away from peers making a bad choice, time after time after time? To do so without then becoming the target of that peer group continually making poor choices? Proverbs 13:20- He who walks with the wise grows wise, but a companion of fools suffers harm. One of our most basic parenting principals is that we set our children up to succeed not to fail. We do not ask of them, or demand of them what they are not capable of. Children below the age of reason are not capable of consistantly turning away from their peers, so we do not ask our children to do so. Our prayer is that, in the days to come, our children will serve God and be a force for the better in the world at large. God can use anyone, but how much more successful will the ministry be of a proven and trained worker? We defeat this goal before we start if we allow the evils of the world to destroy them before they are educated enough, strong enough and mature enough to stand up for the Right and be that force for Good. To change the world for the better they are going to need a strong and straight moral compass, a rock solid faith and a stalwart education. The Nation is going to need them, God expects me to have them ready. *Psalm 127:3 Sons are a heritage from the LORD, children a reward from him. *Deuteronomy 6:6-7 These commandments that I give you today are to be upon your hearts. 7 Impress them on your children. Talk about them when you sit at home and when you walk along the road, when you lie down and when you get up. *Deuteronomy 4:9: Only be careful, and watch yourselves closely so that you do not forget the things your eyes have seen or let them slip from your heart as long as you live. Teach them to your children and to their children after them. *Romans 12:2 Do not conform any longer to the pattern of this world, but be transformed by the renewing of your mind. Then you will be able to test and approve what God’s will is—his good, pleasing and perfect will. *Proverbs 13:20 He who walks with the wise grows wise, but a companion of fools suffers harm. *James 3:15-16 Such “wisdom” does not come down from heaven but is earthly, unspiritual, of the devil. 16 For where you have envy and selfish ambition, there you find disorder and every evil practice. The Right Choice: Home Schooling, by Kennedy is an old book but I like his discussion of Christian children in the schools. On page 111 to the concept as Christian children in the public schools as “missionaries” or being sent there to be the Light of the Lord in the schools. This is an often used argument for why Christians SHOULD send their children into the world rather than keep them “separate.” Kennedy notes that nowhere in the Bible is there a precedent for a youth missionary, not even teens. The people of the Bible sent out into the world to be a “light” were adults, educated and mature in their faith, people beyond the age of reason and accountability, not at risk of being easily corrupted by the worldview. Conventional education operates on the philosophy that education is neutral – that it merely conveys fact and that facts do not require a spiritual context. That sums up my fundamental “problem” with a public school education quite nicely. We believe that facts, whether scientific, mathematical, historical, or otherwise, can only represent truth if they are taught in the context of a Christian worldview. We believe there is no neutral standpoint, to try to avoid God is to deny Him. I accept that the school system as a whole cannot teach a specific set of values, there is no practical way to address the diversity of faiths with in a school. It would be too much to address the diverse Christian views alone, much less add in Jewish students and others. That I acknowledge, understand and respect. The fact that schools cannot teach values; it is inherently impossible. Values are my responsibility as a parent. My issue is when the schools deny the Judo-Christian values and choose in their place another set of values to teach. If values were simply NOT taught that would be another case; and I would frankly feel better placing young children in a school like that, where it is understood and agreed that value education is to take place at home. I do not think such a school is practical, or realistic, but it is one I could support. Home education is always a hot topic, and as our great nation faces more and more challenges it is more and more a hot topic. It is a topic each parent must answer to God for. Right now there are many choices; but the A great place to start really thinking about your child’s education, if you want to home school or even if you are happy with the public schools, is to make a family Education Mission Statement. Here is a link to mine: http://scribinglife.wordpress.com/education/family-education-mission-statment/. Think about what you want your child to look like as an educated adult. Think about the skills you want them to have, the wisdom you want for them. Think about how you want this happen, think about what you want to avoid as much as what you do want. Reality is there may soon be a day when you have no choice but to teach Sally to read at the table in the kitchen, are you ready? Have you even thought about your education choices in the light of moral questions and the future of our Nation? Don’t miss Part 2, where I discuss the “How-to” of homeschooling! I hope you enjoyed my friend, Aimee’s article on the reasons WHY home education of children works for many families, the historical significance and the behind-the-scenes information she provides. And WHY home education will be important in our near future as a nation, whether we choose to fully educate our children at home, or merely fill in the gaping holes in our kids’ edcuation that are left when traditional public/private schools allow many necessary for life skills and faith education fall by the wayside in favor of budget cuts and teaching of political propaganda. So, this week will be insanely busy. Thus I’ve asked a dear friend to do a series of guest posts on the topic of New Frontiers in Education. My friend, Aimee Packard is a mother of 2 special needs sons who homeschools her children and also has them duel enrolled through her local school district for Sp.Ed. services only. In her first post, aimee discusses the “WHY” of homeschooling and “WHY” it may be necessary for families to return to home educting their children in the near future. Her 2nd post will cover the “How-To” of getting started with homeschooling. We have our Littlest Pioneer Girl, Anna’s baptism on Easter Sunday at St. Stephen’s Episcopal Church in DeSmet, SD. This is the last Sunday for the St. Stephen’s Congregation in our church building. I am heartbroken over this, I feel like I am the only person in the world who cares about the history of our parish and how it is deeply tied to the Pioneer History of the Dakota Territories. We tried for several years to get the Laura Ingalls Wilder Society to purchase the church building and start necessary repairs, but with the economic downturn affecting tourism, the Society itself didn’t have the money to do it either. It frustrates me that me and my family arrived several years too late in order to try reviving the parish with a Sunday School and youth programs to draw in new families. And it angers me that most of the former parishioners (for whom it was their 2nd church, only to be attended on special occasions) ran off many would-be church goers and refused to donate moneys into the offering plate to provide for the church’s routine expenses (such as the electric bills) or assist with fundraising for repairing the roofs, floors, paint and to update the furnace and electrical systems or to supply some sort of toilet facility. For over 50 years they neglected their church into such disrepair that now it is beyond all reasonable hope for the dwindled number of congregants (there are 7 of us now, not counting the retired supply priest) to maintain, let alone repair. I insisted that IF the church were to be closed, we were going out with a BANG! The biggest bang, would of course have been a wedding… but since nobody is of marriagable age that isn’t already married, the next best thing was a baptism… and that we CAN DO. We want our little girl, Anna, baptised anyway and Easter is such a lovely time to do it. We will be having a lovely “after-party” with cookies, cupcakes, maybe some sandwiches, juice, coffee and tea. I bought a new camera Friday to replace the one my boys broke, so be looking for lots of pictures next week. I plan to take some of the original church building Charles Ingalls built with the help of neighbors, which later became the parish hall (although it’s not been used in years due to the disrepair). Charles Ingalls was well known as a carpenter and builder, he often took construction jobs in order to make ends meet for his family. Anyway, I am in the midst of sewing Anna’s Chrisening Gown and have a long week of sewing and cleaning ahead. Pioneer Pa and the 2 Farmer Boys will have matching vests for Easter (the boys got store-bought dress shirts, as they had a concert at school last week and Ma was on short notice about it to sew them shirts.) Pa will have a new, handmade dress shirt in lavender (purple is his favorite color) and I will also be making myself a new dress. My parents and perhaps my 2nd youngest brother will arrive Friday evening for the holiday weekend. I am hoping the weather cooperates and we are able to BBQ this weekend and eat outdoors. I also have more seeds to start for the garden this week, for plants that must be transplanted. Our heirloom seed order from Baker Creek Heirloom Seeds ( www.rareseeds.com) arrived last week and I am so excited about that now that we are less than 8 weeks from last frost. And now my friends… it is time for Mystery Recipe Monday. I had a question from my friend Aimee about quick snacks tha are healthy-ish and Gluten Free…I answered Rice Krispie trears w/ dried fruit and another friend of hers said something about granola… I’ve been thinking on how to smash both ideas into one for a couple weeks and came up with…. Drum roll, please….. This weeks’ Mystery Recipe is…..
Equipment: A large stockpot or dutch oven, a cookie sheet, 1 or 2 large oblong cake pans (depending on how thick you like your treats), rubber/silicone spatulas, cooking oil spray, measuring cupand spoons and a wooden spoon. Place oats in oven to toast, keep a close eye on them, they can burn easily. Coat your pot with shortening to prevent the marshmallow goo from sticking. Put the margarine in thepan and begin melting before adding marshmallows. Add the marshmallows and stir frequently to prevent them from burning. Once melted, remove from heat and stir in vanilla extract. Stir in cereal and then oatmeal until well coated. Stir in dried friut, coconut and nuts. Spray cake pans and spatulas with spray oil. Scrape treat mixture out into pans. Put on disposable gloves and grease your hands with shotening. Press treat mix firmly into pans. Allow to cool. Cut treats into “granola bars”. These can beindividually wrapped in waxed paper or plastic wrap and placed into zip-top storage bags for later use. They make great on the go snacks, a quick handy dessert or wonderful additions to lunchboxes for school or work. *Please note this is a rather large batch (you could cut the batch size into 1/3’s if you wanted), as the idea here was a make ahead snack or lunch box item that would be on-hand for grab and go use and as a more healthy option to many of the expensive ready-to-eat Gluten free snacks and bars that are available at the market. So this batch represents about a weeks worth of bars (assuming 1 person/day) for a family of 4-6 people. Variations: You could substitute peanut butter, sunflower butter or other nut butter for 1/2 of the margarine. You could also add chocolate chips to the recipe if you wanted to make them chocolate flavored. Cinnamon or pumpkin pie spice also make interesting additions (about 2 tsp. or so… i often do spices to taste and I LOVE CINNAMON!). Other dried fruit opions: raisins, dried apple,chopped dates/figs, chopped dried tropical fruits.